...... ), software serial numbers, non-web account information, and freeform secure notes to store any data you'd like to keep safe from prying eyes. * Locks your data behind your choice of a strong password or a 4-digit unlock code. * Even if your mobile device is stolen or misplaced, your 1Password information is safe. * Syncs safely and securely from 1Password for Mac and 1Password for Windows using the free Dropbox service. * To read up on how to sync you can check it out in the 1Password User Guide. * Sync your data even if you switch to another app or lock your device. * Copy and Paste. Easily copy passwords into other applications or credit card numbers into web forms. * Support for Multi-tasking. You can automatically lock 1Password when switching to another app or set it to lock after a time-out. Qweas is providing links to 1Password for Android 1.8.1.1 as a courtesy, and makes no representations regarding 1Password for Android or any other applications or any information related thereto. Any questions, complaints or claims regarding this application 1Password for Android 1.8.1.1 must be directed to the appropriate software vendor. 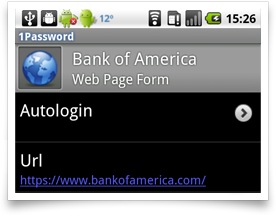 You may click the publisher link of 1Password for Android on the top of this page to get more details about the vendor.